Chomeizan-Jizoin-Tokuzoji temple was founded by a priest called RyoyoDogen during Tensho era(1573-91) of Azuchi-Momoyama period,during which Oda Nounaga and Toyotomi Hideyoshi, the two most important generals before the Tokugawa shogunate,ruled the country. 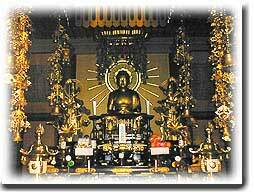 Tradition holds that when Dogen,an itinerant priest,happened to be around Osaki,he was inspired that it should be the place for him to settle down and build a hermitage.The image fo Amida Nyorai and those flanking it images of Kannon Bosatsu and Seishi Bosatsu all of which are housed in the temple,are thought to be the ones that Dogen personally enshrined in his original hermitage. Five Koshintos(small pagodas on which characters or images are engraved to remind common people of the importance of continence and self-discipline)in the templeyard are acknowedged as important cultural assets of Shinagawa ward.The oldest of thhem was built in the twelfth year of Kan'ei(1635) and is the earliest existing stone monument in the ward. Other important assets include images of Shio-Jizo(healer of eye diseases),Miwa-Jizo(healer of pain from decayed teeth),Roku-Jizo housed in the main building and from the days of Buddhist pilgrimage across the country. Though Tokuzoji has undergone many disastres such as fires and earthquakes especially in the fire in the third year of Kaei(1850),the main building and all the assets and documents left to each successive head priest were reduced to ashes-it has each time been reconstructed or maintained by the efforts of prisets and parishioners,thus remaining to be a guiding light for the local populace for more than four centuries. Tokuzoji is within 5 minutes'walk of Gotanda station. Copyright (c) 2004 Tokuzoji All Rights Reserved.